My name is Lindsay and I love my blender. Now repeat after me: my name is ____ and I love my blender. Some of you hear the word BLENDER and you think of a rubbery smell or a smoking motor. Let’s just say – I’ve been there. Holy green smoothie with chewy black rubber pieces in it, have I been there. A middle of the road blender is both a blessing and a curse. But even if a middle of the road blender is what you’re working with right now, it’s still mostly a blessing because it can be a gateway to greater blender things. And with that, let’s take a moment to reflect of the ghosts of blenders past. Just for reference, I started my cooking life a few years ago with this lovely little Oster blender. I think we registered for it at Target when we got married. It was nice. It blended things. It made us many-a-good meal, even though I often had to stop and stir things up or push things down or just generally help the cause in some way or another. But it was a good first. Thank u for the good times, little blender! When we lived in the Philippines, I had a green blender. Okay, now for the big one. And let me tell you – that Blendtec is a beast. It can handle, well, basically anything, considering I’ve had mine for two years and used it exactly 684 times (there’s a digital counter on the screen that reminds me how obsessed I am). I’ve tested it to the max with lots of thick and hard mixtures, and it’s STILL purring like a kitten. You can get the brand new Blendtec (I have the Designer Series in black) on Amazon. It has a 4.5 star rating out of 300 reviews and it comes with a 8-year warranty. Wait, though. EIGHT YEARS. 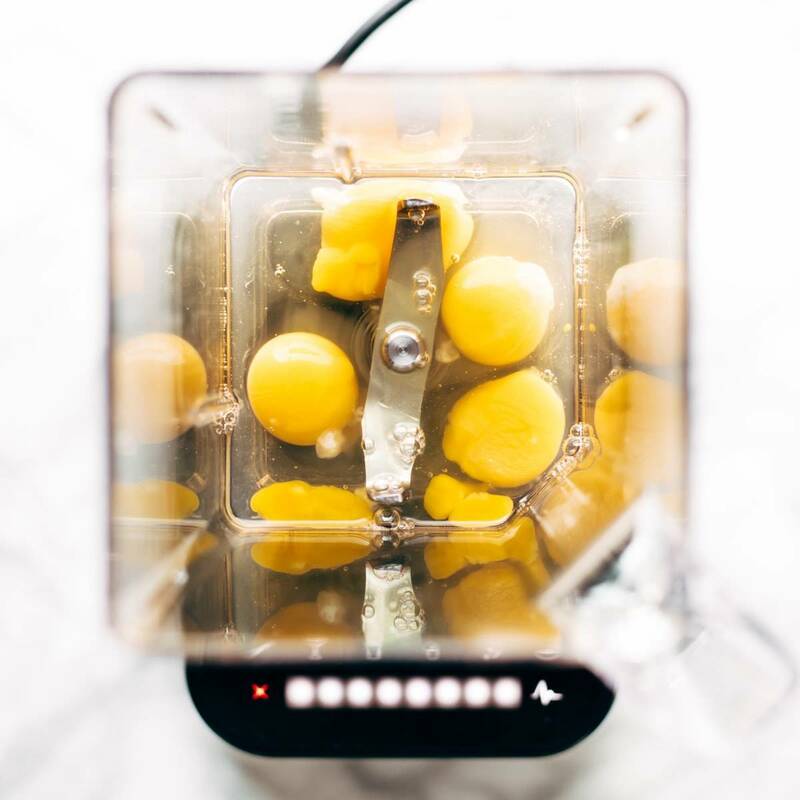 Possibly an even better choice – you can get a refurbished Blendtec from the Blendtec company itself for $279 – and get this -> you STILL get the eight year warranty. 🎉 We have a refurbished model of the Designer Series and it’s been great, if you can’t tell from my zillions of recipes featuring this blender. Regardless of which option you take, it’s still an expensive blender. Please don’t buy one of these epic machines if cooking is not a big part of your life – for you, the Oster (or American Heritage, if you live in the Philippines) will do just fine. That being said, it’s been an extremely useful tool for me – I’m doing the math for the 684 uses in two and a half years time which means I’ve averaged more than two uses per day?! 😜 – and for a person who does a lot of cooking and likes to make healthy food in creative ways, a good blender is a must. Here are ten awesome ways to use your blender, whatever kind it might be! Why it works: Well, let’s just get the obvious out of the way. Smoothies are still a totally genius way to use your blender even if it is cliche, especially when you take advantage of a super-high powered blender’s ability to puree everything (INCLUDING GREENS if you dare) into a creamy, luscious soft-serve texture. Why it works: It’s a weird little trick of the Lazy Girl trade – making lemonade in the blender is so easy and so super good. You put a bunch of limes and lemons in there with some water and sugar – annnnd blend. 🍋🍋🍋 You wait for the lemon pieces to separate, drain out the liquid, and stir in a little sweetened condensed milk bc you bouta treat yoself. Why it works: A better question is why NOT give your pancake batter a quick whirl through a blender? One of my favorite everyday pancake recipes (compliments of my bestie Ang) is made in the blender in about five seconds flat. Hop to! Brinner awaits. Why it works: Soups in the blender are one of my favorite things of all time, especially when the soup base has a few potatoes or other starchy vegetables to just hold it all together with a slightly thickened silky smooth perfection. 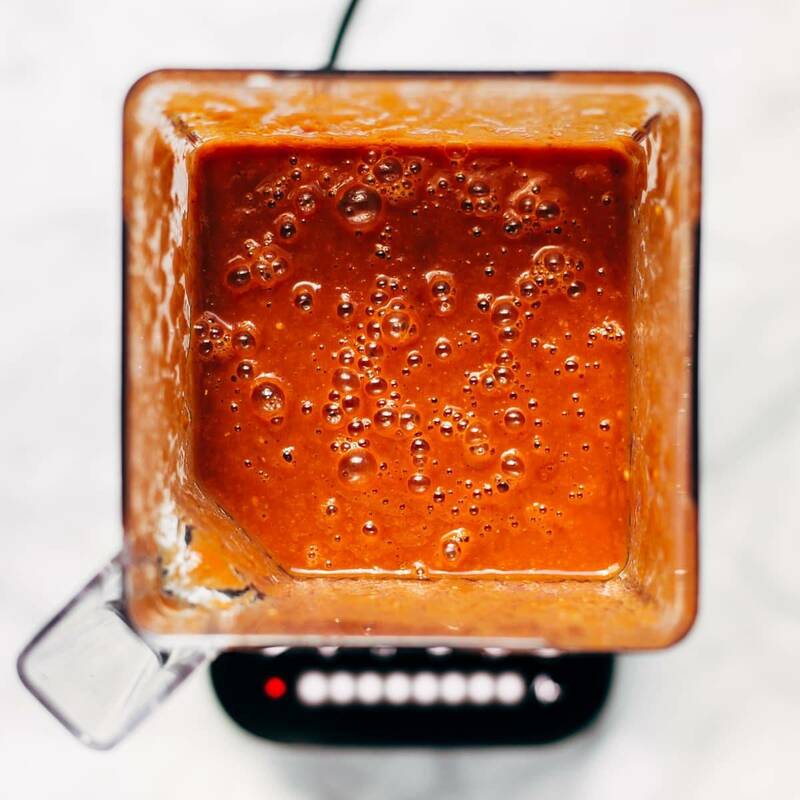 I never liked butternut squash soup until I owned a Blendtec – true story. That smooth texture can make a lover out of anyone. Why it works: I guess I don’t really know WHY it works, but it does work. Whir those eggs around in the blender for a few seconds and you’ll have yourself the most lovely fluffy scrambled eggs and/or omelettes of your egg-eating life. I’m crossing fences for this one because I don’t even like eggs. But Bjork loves them, and it’s true that even I might be able to come around for some super soft scrambled eggs loaded with goat cheese when they’re this fluffy. Recipes: I don’t have a recipe that directs you to use a blender for the eggs, but just take any recipe you have and instead of whisking the eggs by hand, whir them up lightly in the blender for about ten seconds. As for specific ideas, I think this is my ONLY acceptable egg recipe – Goat Cheese Scrambled Eggs with Pesto Veggies. Why it works: Take everything you were going to chop up and simmer into that sauce and put it in the blender instead. You can retain some texture, but the aromatics like onion and garlic get distributed evenly throughout the sauce. Dressings, sauces, everything. It’s so hard to go back to regular chopping once you make this your MO. 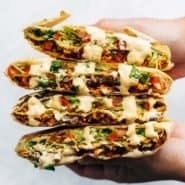 Recipes: Lazy Girl Chicken Quinoa Enchiladas (pictured), Spanish Chicken and Potatoes, Sesame Mango Chicken Teriyaki, and there are a million more examples on this site – this is basically how I cook everything. Why it works: I’m lumping these all together because there are just endless possibilities here. A good blender can take anything in this category (nuts, oats, grains, seeds, you name it) and make it into something new. Oats become flour, cashews become cream, and almonds become milk, just to name a few yummies. Why it works: I literally picked vegetables from my garden for this salsa. 🏆 I HAVE A GARDEN and it GREW THINGS. But I digress. This one is a tad bit tricky because fresh tomatoes can get kind of weird-textured and light pink colored in the blender. But if you add a few tablespoons of tomato paste, and pulse gently, just a few seconds at a time, you will end up with a gloriously easy, still red, chunky, fresh salsa. From your garden. Why it works: This post wouldn’t be complete without mention of that creamy cauliflower sauce. So… mentioning. When I made it again for this post, I re-discovered my love of this white gold stuff. Creamy, adaptable to whatever flavors you want, and full of NUTRITIOUS CAULIFLOWER. No one has to know. Recipes: no recipe – just pour whipping cream into the blender and turn on a medium level setting until it’s thick! Why it works: Yeah, this one is a little bit of a weirdo-person thing, but worth mentioning since I’ve joined the ranks of the Composters this year. 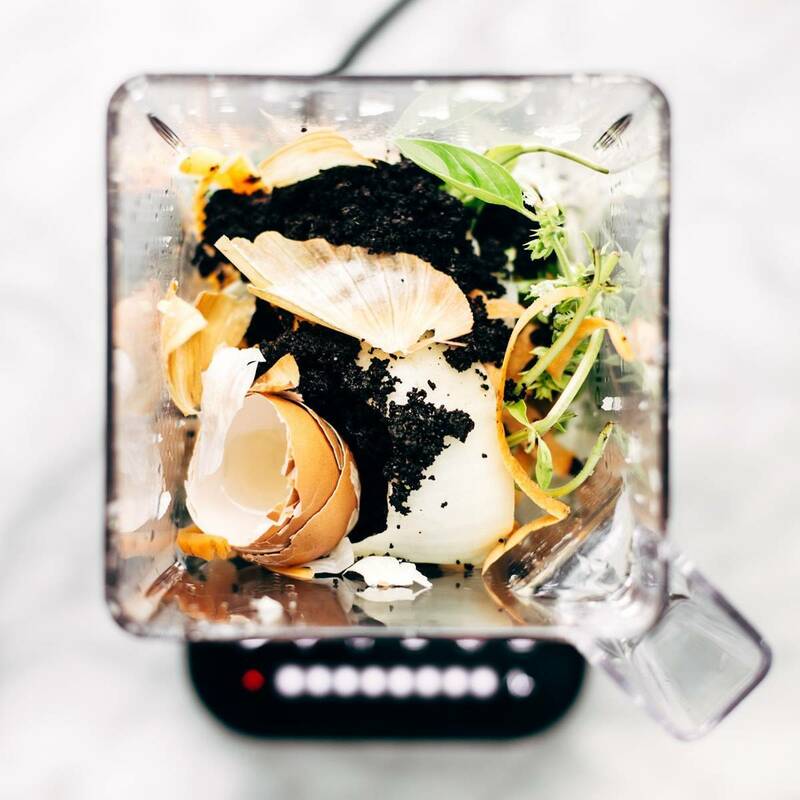 A high powered blender can be a great way to break down your food waste that is headed out to your compost bin. Which means you’ll get nutrient-rich dirt faster! Which means more tomatoes and basil and green beans. And you don’t have to really touch anything. You compost, right? You guys, if I (captain of team Lazy Girl) can compost, you can most definitely compost. Just think how right you will feel making granola every day after you start composting. Worth it. Whether you go the NEW Blendtec route via Amazon, the REFURBISHED Blendtec route in order to save $175, the regular little Oster blender route because you’re new to this whole thing, or the don’t-need-to-get-anything-cause-I-already-have-one route, I see many blender adventures in your future. Pst – do you have a blender you know and love? Leave a comment and let me know – I’m on a quest to find the best possible blender brands and varieties of all time. Disclaimer: The links for the blenders in this post are affiliate links. I would love to be a blender twin with you! First, a blender is great for prepping food/kitchen scraps for your worm farm, if you have one. It’s also great for blending up moss with buttermilk for painting on planting pots, rock walls, etc. where you want to create a quick mossy area. Just remember to water those porous areas you painted well (misting at least), keeping them damp. Now, on to musings on compost: The more often you “fluff” or turn your compost, the faster you will get finished compost, assuming, of course, that you are keeping the pile moist and have a good balance of green and brown plant matter. About 6 weeks is the norm, unless you are adding some super nitrogen source and turning it alot. If I’m in a hurry to get finished compost, I turn mine every 3 or 4 days, and moisten it layer by layer while rebuilding the “compost pyramid” with a bowl shaped depression in the top. After watering it, the compost should be as wet as a wrung out sponge. Any more water than that is too much, and less than that is not enough. What I mean here is ‘damp’ not ‘dripping’. Adding red wiggler worms will also help speed up the process, and will improve the quality of the finished compost because of the high nutrient worm castings that will be included. If I see vast numbers of worms when I’m rebuilding the pile, I sort some out and just spread them in the yard and/or around flowers or fruit trees on a damp day or right before watering the plants, since the worms help keep the soil nice and fluffy and those worm castings again will be helpful to my plants. The organisms that turn your kitchen and yard waste into black soil like moisture and air. You will be able to tell if they are happy, because it will get HOT inside the pile, and it will smell like a damp forest floor after a rain. 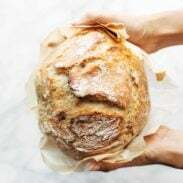 If it is stinky, it hasn’t been turned enough (especially if you added grass clippings, which need to be well spread out–no clumps) or you have put some kind of oil/fat or other animal matter in there that is rotting. If you open up the compost pile and see lots of while ashy looking stuff, it might be too hot, so turn it and water it, and maybe add more brown matter (like leaves or shredded paper). On the other hand, if your pile doesn’t seem to be heating up, you can distribute any good nitrogen source (boxed fertilizer, grass clippings or manure from herbivores [horse, cow, goat, rabbit, chicken) through it in layers as you build up the cone shape, and that will help get it cooking! I just love turning my compost pile in the winter and seeing the steam rising off it! Hope this helps. Happy composting! Wow, great tips KD! Thanks! Thank you for such a thoughtful response! I copied all that info to my notes so I can save it and refer to it when we start to compost. So helpful. I TOTALLY agree!!! I, too, have a Blendtec which I bought several years ago after so much frustration with weak motors in previous blenders. I can’t imagine EVER buying another blender again! I love it and use it for so many things. It’s so powerful! I just made breadcrumbs in it this morning. Love your blog!! Keep up the great work! Two that I had never, ever thought of: whipped cream and lemonade in the blender. Wonderful! Thanks Traci! we are currently obsessed with that lemonade. Awesome! Love that recommendation – thanks Jenny! But the Ninja is nice too, isn’t it? I have been wanting to try it out. Yes it does an awesome job at smoothies and chopping etc. I have yet to get the creamy texture that is demonstrated by your coconut green smoothie though. I love my Ninja, I dehydrated corn last year and put it in my Ninja and make flour for cornbread. I’m also on the Ninja bandwagon. Blender and food processor (plus personal-sized smoothie cups in one) – best wedding gift evah! I love my Blendtec. Seriously it’s amazing. I recommend people buy one from Costco online. You get an additional year of warranty (8 years) and they have a package with the regular size jar and a twister jar that is really great for ice cream and thick sauces. I paid $350 for mine. Another thumbs up for the twister jar! A few years ago, I bought a refurb Blendtec that came with the regular and Wildside jars. It’s been great for almost everything except for small volumes. I got the twister jar last year and love it! It’s perfect for blending just a cup or less of sauces or nut butters. IMO, all Blendtecs should come with the twister jar. I should have mentioned that! I have the Twister Jar too, but I don’t use it as often as I would have expected. Although it is perfect for smaller batch things like dressings, like you said, Sheila! I have been thinking about composting, but really need a 1-2-3 on how to. Can you share a little on this?Thanks for the new ideas. Hey Marjorie! That’s a great idea! I’m not an expert by any means – just started this year – but I’d recommend the book Square Foot Gardening as a starting place (if you’re interested in learning about gardening, too). Also my inspiration was my friends Alex and Sonja of A Couple Cooks – they might have some resources on their site as well! Why oh why have I never thought of making whipped cream in the blender before?? I have a feeling this will be life-changing…plus, all the link-reminders to those amazing recipes…yep, I’m sticking with Life. Changing. I seriously want to try Vitamix and see what all the fuss is about! Goals. I’m curious if you’ve ever tried making mayo in your blender. I’ve tried with my emersion blender and it’s usually hit and miss. But when it’s a hit, it’s a hit. Thanks for your thoughts! Awesome timing!!!! My first Blendtec literally just arrived from Bed Bath and Beyond yesterday!!!!! I got the light turquoise one!! I am so excited about the whole food function – I’ve never eaten strawberry leaves before!!! My sons can’t wait to try out the ice cream function!! Oh my gosh, so exciting! 🙂 Have fun! Things that DON’T blend well in Blendtecs? Small glass jars. I’ll spare you the story on that one. But HOORAY for the 8-year warranty!! I can’t wait to try this lemonade (among all other things). Laughing out loud. I can only imagine. Its my Vitamix for me! Have had it for 10 yrs, no issues. This machine is a POWER horse! I have used it daily since we first got it. I have had digestive issues for years and the Vitamix has been a part of my path to new health! We have made all the above things you mentioned, and couldnt be happier. Smoothies are a part of our daily regime and an easy way to get multiple fruits and veggies into our diet. Even my picky kids love them! Love that Alison! Thanks for the comment! Oh, I never thought to make scrambled eggs in the blender. I bet that would make them so fluffy. I love my VitaMix, and have found that it can double as a great spice grinder. If you just cover the blade with spices and crank it on high it can break down spices in no time flat. What a great idea! I have done that but it didn’t work well for me… maybe I needed to get more whole spices in there. I’ve never heard or thought of whipping cream in the blender, but it sounds genius! I’ll have to come up with a delicious reason to try that one! Great post! BLENDTEC all the way for us! Have the black in the Designer Series as well, and have reached 1,976 uses and no issues at all. The main reason I chose Blendtec was the fact it fits under my cupboards on the counter, and the 5 sided “Wildside” jar is amazing…no cavitation requiring a tamper stick. 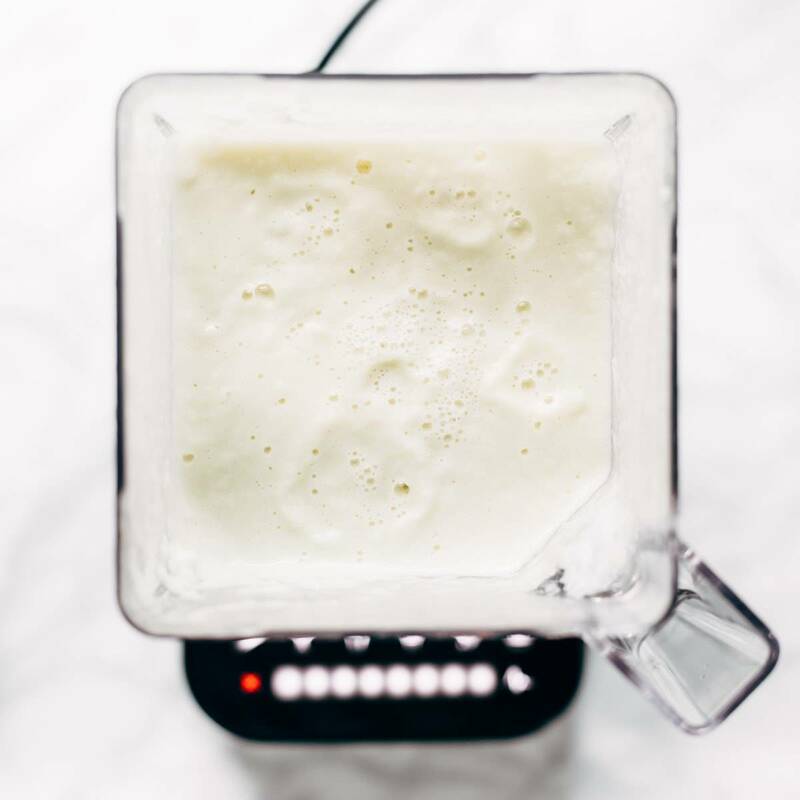 Having said that, I use it for 4 smoothies a day plus your amazing recipe for the creamy cauliflower sauce, soups and just about everything you’ve mentioned, except the whipped cream…why I didn’t think of that is beyond me. Love your blog! Thank you, thank you, thank you. WHAT! You are amazing – 1,976 uses!?!? Awesome. I love my Vitamix, that’s for sure! It has never occurred to me to use my blender to mix fluffy eggs or for whipped cream! Totally genius! That Lemonade is such a great idea! And now I want a Blendtec, but no such luck here in India! Yes! WORM BIN!? You granola genius. Aw how fun! Love hearing that – black bean brownies sort of scare me but I’ll believe you. I LOVE LOVE LOVE my Blendtec. I hadn’t thought to mix my eggs nor whipped cream in it. Can’t wait to try that. And I’ve used mine to blend up compost materials, too : ) My jar had an explosion while making a smoothie the other day (not fun to have smoothie spit everywhere all over the kitchen!!! )–very strange. I think the frozen items got jammed and a hole burst in the side. Anyway, super excited that the warranty was still good and the folks at Blendtec sent me a new jar. Cool! Thanks for all the ideas, Lindsey. Oh my gosh, scary! Yeah – we have gotten a replacement for our little Twister Jar once – they are really quick with the replacements. Thanks for the comment Maria! I got tired of waiting for a supplier discount for a Vitamix so I went with the Ninja kitchen system (blender pitcher, mixing bowl with dough blade and cutting blades, and 2 single use cups). We have loved it for close to 2 years now. But I have used my bowl so much that I cracked it. So I am in the process of getting it replaced. I would still love to test drive a VitaMix AND a Blendtec!! I have yet to make the cauliflower sauce and have never seen the lemonade recipe so I will be trying that very very soon. Love that! Thanks for the comment! Talk about perfect timing – our blender is about to go. Thank you for sharing the Blendtec and all the great ideas of uses for the Blendtec. NEVER thought of making whipped cream in a blender. Can’t wait to try. I’m living proof that it can be done! We drooled over having one of these super high end blenders for a long time. But it came down to the fact that we didn’t want to spend that much. We discovered the Kitchen Aid Blender for 100-200 dollars. I really feel it can blend just as good as my sisters Blendtec! It is an amazing machine for half the price. What a great find! I’ll have to look into that as well.